At Sonoma Academy’s inaugural Evolutionary Olympics, two long-time rivals came out to compete against each other in an intriguing matchup featuring two very different skillsets. 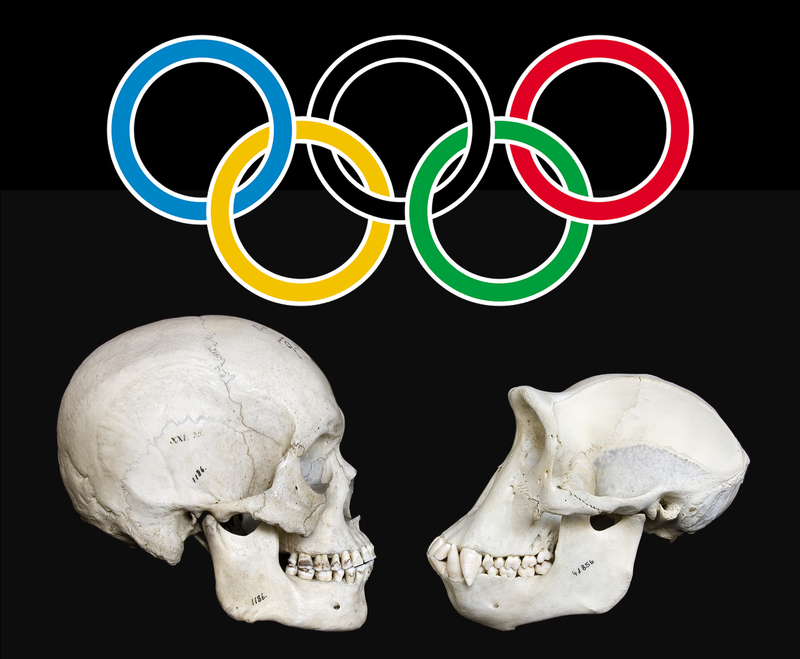 But our sophomores weren’t suiting up for the U.S. of A.—they were representing hominins and primates, and the goal of the games was to demonstrate Homo sapiens’ anatomical advantages over other hominins/ primates. I designed these kinesthetic experiential demonstrations with the goal of fostering a deeper understanding of the role of physiological advantages in the course of natural selection. The first event entailed hunting down an unwitting milk jug with a traditional Maasai Warrior conga throwing club (which was fitting, given that the Maasai’s territory is so close to the Rift Valley of Africa, the birthplace of humanity). Primate students threw the conga at the milk jug from a quadrupedal position, and hominin students threw the conga from an upright, bipedal position. The bipedal students’ higher field of vision afforded them better accuracy than the quadrupedal primates’ field of vision. The next event (long throw) was a demonstration of the differences in throwing power/distance. The bipedal hominin throwers noticed that they were able to get much more torque from their hips when they threw the conga on the run (quadrupedal primate students could throw from a stationary bipedal stance but not from a running position since quadrupedal animals need four legs to run any significant distance). Then we tested whether stereoscopic vision or monoscopic vision would provide better depth perception for hunting. We used the conga again—one group threw the conga at the milk jug with one eye closed and another group threw the conga with both eyes open (here we strayed a little from the hominin versus primate challenges since both of these animal groups had stereoscopic vision). Strength and accuracy in hunting are all well and good, but as any craftsman knows, you’re only as good as your tools. So I wanted to find a way to get students to see how the relatively young Homo sapiens species achieved dominance over other species through technological advantages. Ask any student what differentiates humans from other animals and you’ll probably hear that humans have opposable thumbs. But what’s often not taken into account is the fact that other animals (and not just primates/hominins) also have opposable thumbs. I wanted my students to understand that small anatomical differences could make huge differences in the course of evolution—something as seemingly insignificant as Homo sapiens’ ratio of thumb to other fingers actually had a big impact on our tool-making dexterity. So in order to demonstrate differences in thumb length, we set up a race to compete against each other by seeing who could paper-clip loose papers together the quickest. Some students had to keep their thumbs bent at the first joint, other students could use their thumbs regularly like a human, and other students had to tape two dry erase marker caps onto their thumbs as thumb extensions. In the spirit of science, it is only responsible to acknowledge that some of the deficiencies of quadrupedalism, monoscopic vision, and shorter/longer thumb lengths displayed during our Olympics could be due to lack of familiarity on the students’ parts rather than an inherent flaw in the anatomical design itself. However, scientists have controlled some of the variables that we did not control in these Evolutionary Olympics, and the scientists’ results show that there are several key advantages to bipedalism, stereoscopic vision, and Homo sapiens’ thumb length ratio. Unfortunately, our Evolutionary Olympics brought us no closer to answering the lingering question of why bipedalism emerged before the climactic shift in Africa that turned much of the forest land into savannah. By changing from tree dwellers to a terrestrial lifestyle, bipedal hominins greatly increased their susceptibility to predation, and perhaps we’ll find a way to insert predators into the competition in 2016’s Evolutionary Olympics. But one thing our Evolutionary Olympics did demonstrate was an ability to expand the horizon—standing up shifted hominins’ area of focus from the ground upwards to the horizon and even the sky. Perhaps this change in locus resulted in adaptations that were significant enough to counteract the increased susceptibility to predation on the ground. Next year we will add some more events—I’d like to figure out how to create an event where bipedalism’s greater range of distance in vision could be demonstrated. I’d also like to design an event where quadrupeds and bipeds have to simulate carrying a tool or baby as they move across the playing field. Testing thermoregulation of skin’s ability to sweat freely versus body hair/fur’s difficulty sweating could be interesting—perhaps primates and other non-Homo sapiens contestants will don our school’s “Champ the Coyote” mascot suit during next year’s games!